One evening, Li Lan’s father comes to her and asks her if she would like to become a ghost bride. Li Lan cannot believe that he would be serious. A ghost bride? In 1893 Malaya, it’s rare for people to arrange a marriage with the dead, but the wealthy Lim family wants Li Lan to marry their recently deceased heir. Li Lan knows she must consider the ghost marriage to Lim Tian Ching, as it would secure her once wealthy family’s comfort for life. As she thinks about it, she is drawn into the Lim family’s secrets and begins to question the mysterious circumstances behind the death of Lim Tian Ching. Her search leads her into the world of the Chinese afterlife. The Ghost Bride is a novel that crosses over many genres. It’s young adult, adult, historical, paranormal, fantasy, romance and mystery all wrapped in one package. I was immediately drawn into the story of Li Lan and the ghost bride proposition. The descriptions were beautiful. I could easily picture the setting in my head. It also had great twists and turns that kept you wanting to read. 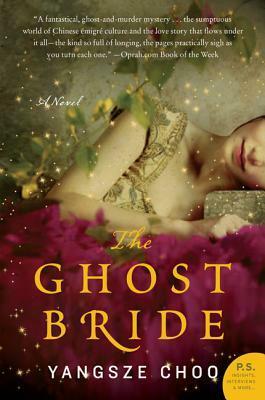 My only real problem with The Ghost Bride was the pace of the book. For being such an interesting story with such great twists and turns, it was a really slow read. I had to force myself to continue reading through parts of it. I think the beautiful descriptions I mentioned before might have bogged it down. I mean, I wanted to know what was going to happen. It just took so long to get there. If it wasn’t for the twists in the story, I might not have made it through — which would have been sad since it is a good story. Overall, I would definitely recommend it to those who like historical fiction and don’t mind a slower pace. The writing really is beautiful and the story is entertaining. Thank you to the author for the opportunity to read and honestly review The Ghost Bride.